Blend all the ingredients for the juice in a masala grinder/blender with warm water. Strain this lovely yellow masala paste using a sieve/strainer to obtain a nice thick caldinho juice & keep aside. Next mix the residue with some more water & extract thinner juice. Keep it aside for further use. Heat a deep pan with vegetable oil & saute the chopped onions till soft. Then add the chopped tomatoes, grated ginger & cook till tomatoes turn soft. Add the second extraction thin juice; stir well & let it come to a boil. Gently slide in the pomfret slices. Let it come to a boil, then add the thick extract, slit chillies, a pinch of sugar & let it come to a boil. Adjust salt & vinegar to taste. Let it simmer & cook for a while. Do not stir too much with a spoon or the fish will break. Let the caldinho settle for a while. Serve hot with steamed rice or with bread. 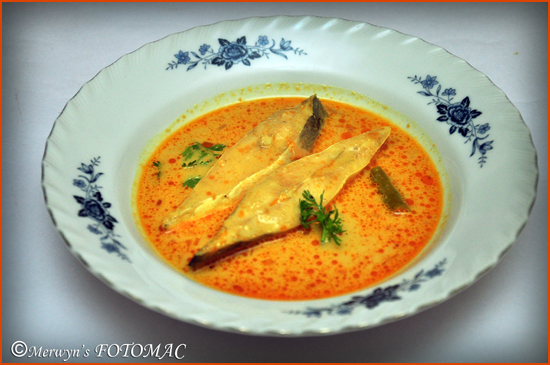 Hi Hilda Mascarenhas, thanks for sharing yr caldinho & fish promphet curry. I tried it was so good never had before. Our parish priest Fr. Malcolm D'Souza enjoyed & he said to convey his thanks & God Bless U.